Scanned topographic maps (raster) of Canada based on the National Topographic System (NTS) 1:50,000 and 1:250,000 scale paper maps published by Natural Resources Canada. The files are geocoded according to NAD83 and have a scanned resolution of 300 dpi. A new digital vector dataset replacing the National Topographic Data Base (NTDB). Data contain more than 90 topographic entities thematically organized into 11 distribution themes: Administrative Boundaries, Buildings and Structures, Energy, Hydrography, Industrial and Commercial Areas, Places of Interest, Relief and Landforms, Toponymy, Transportation, Vegetation and Water Saturated Soils. Digital vector data sets that cover the entire Canadian landmass. Each data set consists of one NTS unit at either the 1:50,000 or 1:250,000 scale. Coverages include the following 13 themes: hydrography, hypsography (contours), vegetation, the road network, roads, the rail network, the electric power network, designated areas, landform and relief, water saturated soils, toponymy and manmade features. New generation of topographic maps at a scale of 1:50,000. Formats: PDF, TIFF, GeoTIFF, GeoPDF. National and provincial level topographic data based on the National Atlas Information Service (NAIS) 1:2 million, 1:7.5 million, and 1:30 million scale digital maps. 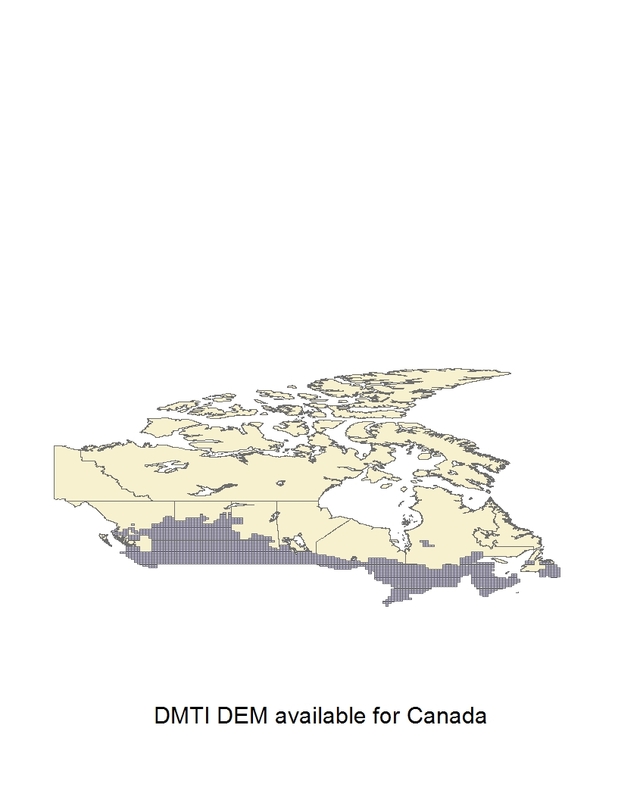 The NAIS 1:2 million-scale dataset provides detailed provincial or regional map data. The 1:7.5 and 1:30 million scale digital datasets provide excellent map data at a national level. It offers many more name attributes (for physical features, populated places and roads) than most other digital boundary files. DEM tiles covering all areas of Canada, based on the NTS 1:50 000 and 1:250 000 scale maps. Data are provided in USGS DEM format, and must be converted into raster format before they can be viewed in ArcGIS. DEM tiles covering most of Canada at the 1:50,000 (30m resolution) and 1:250,000 (90m resolution) scale. Index shows DEM coverage available through DMTI. Data are provided in ASCII .txt format, and must be converted into raster format before they can be viewed in ArcGIS.